Thirteen bands of blue embroidery and two bands of drawn-thread work, with the following design sequence: two bands of chevron; two bands filled with very small chevrons with cross finials; two bands with three rows of squares, every second of which is filled with a further square; one band filled with a checkerboard of very small squares; a wider band with large, ornate chevrons with cross finials; two bands with a rope interlace design; three bands with large S-shapes and small diamonds; a band filled with a drawn-thread work open grid partly filled with an inscription in white flax darning embroidery; a drawn-thread work open grid band. 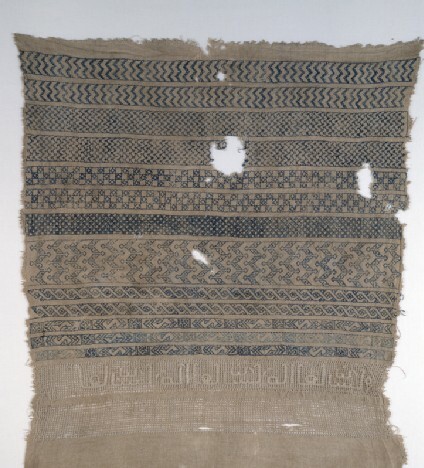 The textile may have been worked as a sampler. The inscription is not legible. The radiocarbon date is 1345 AD +/- 40. This impressive sampler displays a combination of patterns in double-running stitch and drawn thread that must have provided a good reference for both apprentice and skilled embroiderers. Radio-carbon analysis has confirmed a 14th-century date, suggesting that embroidery techniques and motifs were already being documented at this time. Some of the patterns used on Mamluk textiles eventually spread to Europe and can be seen in 16th-century German and Italian pattern books. This exceptionally fine sampler with its orderly arrangement is quite different in character from others in the collection. It has two contrasting types of embroidery worked on it and the patterns are not only continued along the whole width of the sampler but the same ones are repeated for two or three bands. Radiocarbon analysis indicates that it was made in the 14th century, some two hundred years later than No.12 [EA1984.479], where the arrangement is haphazard and only the essential amount of the patterns recorded. 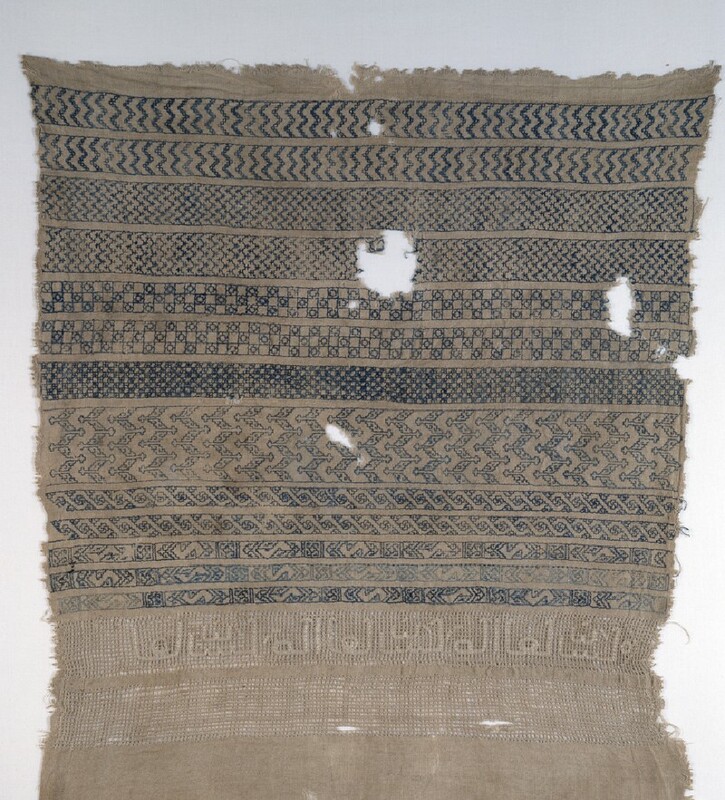 Here the total effect, with its combination of double-running and drawn-thread work on a sampler, is remarkably similar to the later band samplers made in Western Europe; these served as practice pieces for beginners as well as acting as a record of patterns for future embroideries. The stitch is double running which, like pattern darning, is worked by counting the threads of the ground fabric. Called Spanish stitch in the 16th and 17th centuries, it is also known today as Holbein stitch and was described in 20th century stitch books including Mrs Christie's Samplers and Stitches (1920), that was so influential in the revival of interest in stitch. Double running stitch acquired the term 'Holbein' from embroidery on clothing depicted in portraits painted by Hans Holbein the Younger. 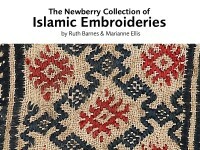 Some of the patterns relate to those seen on double-run embroideries from Mamluk Egypt, which spread through trade connections to Western Europe and were included in 16th century pattern books published in Germany and Italy. The open work below the bands is a simple form of drawn-thread work where every fourth warp and weft thread has been removed to form a mesh. The remaining threads have then been oversewn in both directions so that little crosses are formed at the intersections. An illegible phrase has then been darned into the mesh using white linen thread.